2018 Asian Golf Awards Hits All The High Notes! 2018 Asian Golf Awards Hits All The High Notes! 2018 Asian Golf Awards Hits All The High Notes! 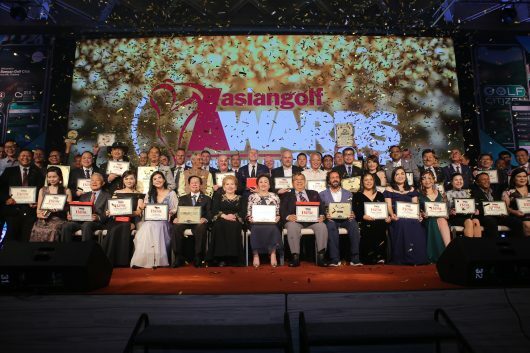 More than 250 club industry executives congregated in the plush setting of the 5-star Hyatt Regency Bangkok Sukhumvit to celebrate the achievements of Asia’s best of the best in the 2018 Asian Golf Awards. The 2018 edition of this largest industry recognition event played out over 45 award categories and left no doubt in the minds of industry professionals that the Asian Golf Awards is the annual recognition event that other similar events are measured by. “I attend all industry functions all over the world and there is absolutely nothing that comes anywhere close to matching the Asian Golf Awards – you guys up the ante every year and this really amazes me,” said the Legendary Guru of Marketing, Andrew Wood. The 2018 Asian Golf Awards was attended by delegates from over 22 countries and it was staged in conjunction with the highly successful 2018 Asia Pacific Golf Summit. The guest of honour was golf legend and entrepreneur Greg Norman who was inducted into the Asia Pacific Golf Hall of Fame. “We are glad that the club industry in Asia gathers every year at our events and it is their support that drives us to excel and go beyond the records set every year – the APGS and the Asian Golf Awards have been staged annually for the past 12 years and we hope that we have the staying power to continue indefinitely,” remarked Mike Sebastian, CEO of the Asia Pacific Golf Group, the owner and producer of both events. The full Summit and awards report will be covered extensively in the January edition of ASIAN GOLF. All video presentations of addresses delivered at APGS will be posted on You Tube within the next one week and there will also be a full record in pictures that will be uploaded within the next few days. Meanwhile, the 2019 Asia Pacific Golf Summit will be hosted in the futuristic city of Gurgaon, India. Details to follow.